South African sprinter Caster Semenya has been given approval by the International Association of Athletics Federations (IAAF) to race as a female. The 19 year old runner is an intersexed individual with internal males testes that are producing testosterone at rates considerably above average for women. 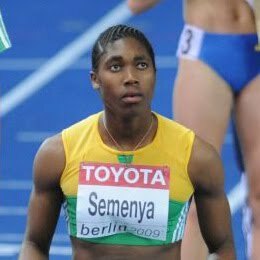 After a gender test in September 2009, the IAAF decided to ban her from racing, citing a biological advantage that was not of Semenya's doing. Now, after conducting an investigation, the Federation has passed a ruling allowing Semenya to race again. This is a very interesting, if not perplexing, decision, and I wonder how it's going to play against the International Olympic Committee's (IOC) recent decision calling for intersexed athletes to have a medical procedure in order to qualify for the Olympics. By all accounts, Semenya has not had the procedure, or if she has, is not disclosing that information to the public. Moreover, the results of her most recent gender test are not being disclosed. So why did the IAAF suddenly change its mind, and why are they not giving any reasons? Did they feel pressured by the public? Is this a case of political correctness on the track? Or did Semenya have the medical procedure? And if so, why not disclose it? Or would that open a huge can of worms -- and a possible charge of a human rights violation? Let's assume Semenya did not have the procedure. Has the IAAF therefore decided that intersexed persons are good to compete against unambiguously gendered individuals? And what about her competitors? I can't imagine that they're very happy right now. This would seem to be a dangerous and ill conceived precedent. Semenya is not the only intersexed athlete currently competing in Olympic sports. What about them? I have a feeling this story is far from over.